The Brown Thomas Spring fashion show was delightful. As an event it was fun and fresh and energetic ... and that's before I even get on to the clothes! Sophisticated, elegant collections previewed from Dries Van Noten, Celine, Peter Pilotto, Diane Von Furstenberg, Lanvin, 3.1 Phillip Lim, Acne, Alexander Wang and more. There was a strong feminine sensibility running through the majority of the collections, and the dress reigned supreme. The key trends were monochrome, colour, quirky prints and the 1920s. My favourite collection was Victoria, Victoria Beckham which is new to Brown Thomas this season. I could just picture Fitzgerald's Daisy in those whimsical, drop-waist creations. Other new labels to look out for instore include Jay Ahr and Isabel Marant Etoile. Check out the video above for the lowdown on what to expect from the Spring collections; some of my (admittedly shaky!) catwalk photos are also below. Enjoy, and let me know what's taking your fancy! on the Fluff and Fripperies Facebook page! The Victoria collection looks amaze. Her Victoria collection was absolutely gorgeous, and more affordable than her main line too. 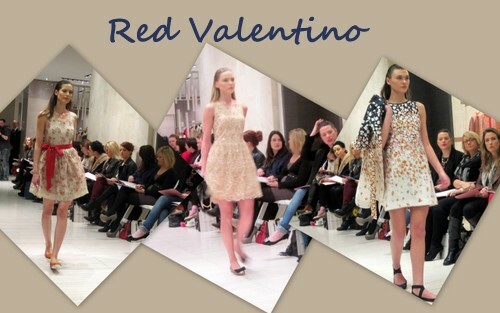 Those Red Valentino dresses are gorgeous. Great snaps Emma - I'm a fan of VB's designs - she's much better at it than I thought she would be. Wish she'd smile a little more though. Old Victoria always looks so grumpy. I used to really enjoy the Brown Thomas fashion show, they always do it really well. Lovely post. great post! love all these outfits! @Cornflakegirl, aren't they just? Such a lovely shape. @Joanne, this was my first one and I loved it! Ok, can we talk about Victoria Beckham? I saw an editorial yesterday post baby and she looked insane. I mean...what the? Loving the Philip Lim & Stella designs! New clothes! Wish I could splurge for spring! The only problem with all this new season loveliness is trying to resist the urge to splurge! What I wouldn't give to own the VB Cat dress. Its so so beautiful. I've been stalking it online for months.